Considered one of Japan’s most innovative ceramic artist’s, Ryoji Koie (b. 1938) has exhibited internationally and taken part in numerous workshops and conferences around the world. In 1991 he spent time in the studio of Sebastian Blackie in Farnham preparing a body of fluid work in stoneware for an exhibition at Galerie Besson. He returned for a second solo show in 1998, after working with translucent porcelain in the studio of Oxford potter Margaret O’Rorke. In June 2010 he spent 3 weeks in residency at the each Pottery St Ives - work from which is on exhibition at the gallery in Sept - Oct 2010. 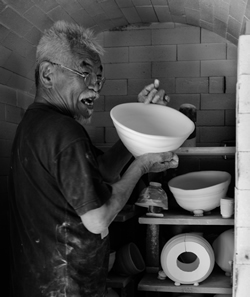 Above: Ryoji Koie at the Leach Pottery, June 2010. Copyright Rebecca Peters. 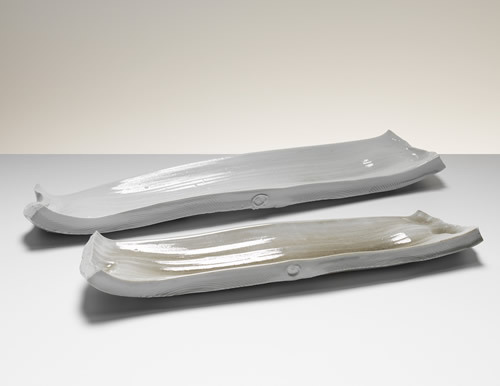 "Ryoji Koie has an extraordinary way with clay. He handles it with a naturalness and playfulness which almost belies his skill and knowledge but which produces work of great freshness, sensuality and vigour. He delights in the clay and selects material many potters would reject as unusable, stimulated by its character just as one might respond to an impossible but fascinating person. He has the open curiosity of a child but is able to focus this with sustained and exceptional intensity. 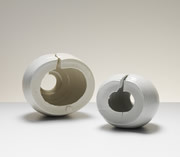 Koie was born and continues to work near Tokoname, a major ceramic centre of Japan. He started to use clay when he left school to work for a tile production company. This may account for his stamina and productivity. 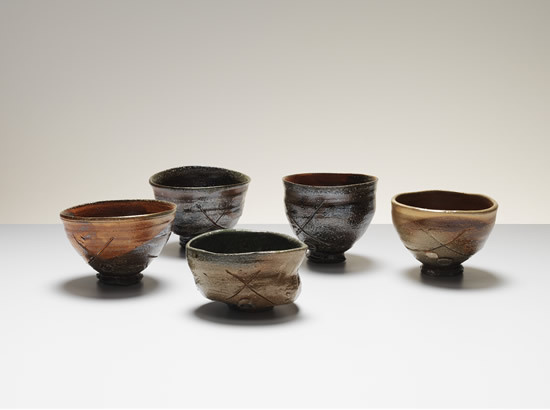 From these humble beginnings he has become one of the most celebrated potters of post-war Japan, however all his pieces retain directness and energy, a characteristic of hand production work, which may stem from this early experience. Koie makes, apparently without inhibition, exploring the creative potential of any idea or thing that comes to hand. Within days of arriving at my studio it was full of his work. Much of the ceramic equipment ignored and many of the tools formed from the general detritus of the workshop. Some of the work has been stamped with the cork of a whisky bottle, perhaps an ironic comment on the conventional potters’ signature, other stamps were made with fragments of a plaster mould, one says “Koie/Anita” another “Henry F Hammond Studio Bentley”, both are tender acknowledgements of his first visit to England. With uncanny perception Koie seems able to gather ideas from quite disparate sources and unite them in a common purpose. During the few weeks he worked here innards of a reject video recorder were fused onto clay in the kiln, fire transforming them into a strange organic mass, subverting this symbol of transience with a more fundamental and emotionally charged technology. He also developed a glaze called “Devil Jumping” made with material gathered from iron stone outcrops of a similar name. The glaze is applied in a way that makes it leap across the pots capturing the spirit of the title. Both are examples of Koie’s wit and inventiveness but also reveal a need for a positive interaction with his environment, whatever it may be. He told me he now feels able to work anywhere, all he need is clay; the exhibition testifies to the truth of this statement. Koie’s work seems to embrace both past and present. It has many qualities we associate with traditional Japanese pottery: tactile, asymmetric, a love of natural phenomena, nevertheless it has a character which is unmistakeably contemporary. He is quoted as saying his works are messages or protests, certainly I them challenging. They are calm and crazy, their eccentricities unforced, friendly and generous, mad like the man himself, a joy to have around."